Now that I’m older, I realize just how lame that thinking is. Or maybe it’s just now that I’m older I don’t have the stamina for that kind of travel, but either way, I get way more out of how I travel now: slowly. Befriend locals, or at least look to them for suggestions. I have always had good luck with this, whether it is suggestions on where to eat or what to do - locals know best! There have been multiple times I didn’t realize it was a holiday weekend, or some festival was going on when I was traveling somewhere, but I would end up getting to catch it because someone I met or talked to mentioned it. Sure you’ll wanna see the Eiffel Tower and the Louvre in Paris, but what part of my trip to Paris will most stick with me? My bike tour. I read a Parisian’s blog before my trip, and she mentioned that every Friday a bunch of locals meet in front of a hotel and go on a 2 hour ride through the city. My friend Montse and I rented bikes and met up with the group and it is one of the single-greatest travel memories I have. (We were definitely the only 2 non-Parisians out of a group of at least 100!) I would have never found that suggestion on TripAdvisor or in a travel guide. Ready for our Parisian bike ride! When my girlfriends and I went to Greece, our first night we asked our Airbnb host to recommend a restaurant nearby. That restaurant ended up being the greatest part of our trip. Not only was the food spectacular, but we became friends with the whole staff (a super sweet family) and still keep in touch with them today (2 years later). Even though we were halfway around the world, we immediately had a familiar place, with familiar faces to go to after an exhausting day of exploring, and that was priceless. Our new Greek fam. THE BEST. Pick a place and make it home. With the advent of Airbnb this is easier than ever since you are in a literal home. What I really mean though, is get to know your neighborhood and become a local at some of the spots nearby. Staying in one place also helps you better experience and understand local culture. I took a weekend trip to Barcelona while I was studying abroad in college. I hated it. It seemed all that city had to offer were endless parties full of drunk ex-pats, and lots of annoying people offering “cerveza, beer” on the streets. It wasn’t until I returned - years later - for a couple weeks that I realized how incredibly wrong I was! 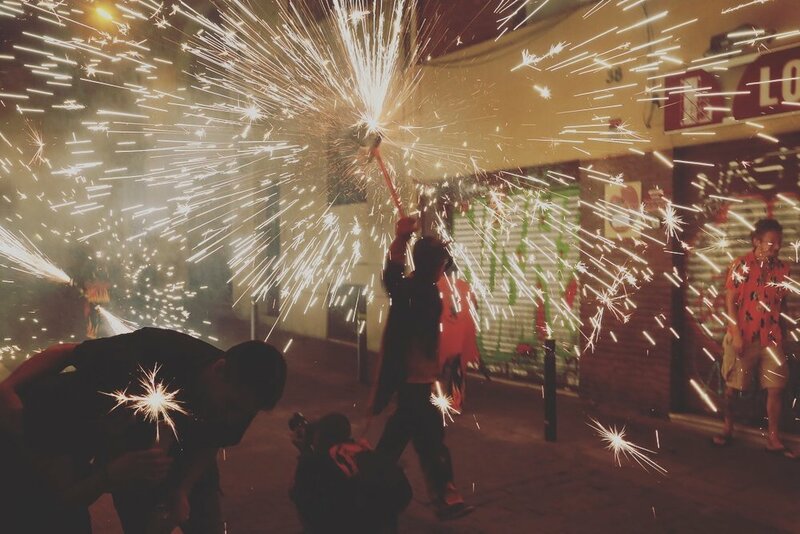 During the second go-round I learned all about Catalan culture by seeing "correfocs” (fire-runners), castellers (human towers), dancing the Sardanas (a typical dance), and So. Much. More. Rarely are just a couple days enough to truly get a sense of a place. Take a bike tour on your first day. I’ve talked about bike tours before, but I can’t stress enough how great they are! Biking around a city is a very fast way to get a sense of size and direction. In Dublin I took a tour and was able to ride by all the sites I wanted to hit up later, which helped me better plan out my itinerary and what to see in what order. The tours also helped me meet new people - local and non-local - which only improved my travel experience whether by having local suggestions on what to eat or see, or having new friends to hang out with the rest of my trip. Get a temporary job. Ok, this might sound crazy, but stay with me. When I was in Barcelona I met another girl from Kansas who told me about a summer camp she worked at in Catalunya. She was friends with the owners somehow, so when I went to Barcelona a couple summers later, I asked if she could give me the information. I was just looking to make a few bucks to cover some of my travel expenses, but I ended up meeting some of my favorite people in the whole world! (I worked there a couple summers and have since visited many of the friends I made there in their home cities/countries.) I also learned A LOT about Spanish culture and customs through working that camp, and got to meet some really cool kids that I still keep in contact with. And of course there was the bonus of being paid to do fun things like go horseback riding, swimming, do ropes courses, go mountain biking, and a whole host of other awesome activities, all in a part of Spain I probably wouldn’t have seen on my own. Kids not your thing? I can understand that. There’s also a cool site called Workaway. Wanna live for free in France just by gardening for a few hours a day? Wanna tour Iceland for way cheaper just by milking some cows each morning? Wanna stay on a Greek Island for the price of picking olives a few hours a day? Search it up on workaway, and off you go. This basically lets you live with a local for free in exchange for a few hours of labor. What better way to get to know a place than by living and working there with people from there?! Let yourself breathe. Sometimes you just can’t fit everything in, and that’s ok (but also especially why befriending locals is important - then you get to go back and have a free place to stay ;-)). Many times I get so caught up in seeing and doing, I experience all the activities of a place, but miss out on the feeling of it. One of the things that draws me back to Spain again and again is the laid-back way of life. Those people work to live, not vice versa, and have the art of enjoying life down. They spend 3 hours eating a meal, savor their wines and coffees, and have nap time built into their daily lives. As a waitress, I always feel extremely guilty if I go out to eat and finish eating and drinking, but continue conversation at a table. I know that server is just dying for me to get up so they can turn that table and make more money. This is not so in Europe since servers don’t rely on tips, thus I can sit back and enjoy those hours long meals guilt-free; what a luxury!